Boy, the posts sure have slowed down over here. It's completely indicative of how much the sewing has slowed down, too. Life & work has just been too busy to get anything done in the evenings. Know how many homemade gifts I'm giving this year? Exactly one, but it was a good one! It was my contribution to our office's gift exchange, which had to be homemade. I made two scarves out of Anna Maria Horner's Little Folks voile fabric (a la Jona of Fabritopia ... thanks for the great & easy gift idea, Jona!) Have you worked with that fabric yet? All of the raves about how nice it feels are not at all overrated. I highly recommend that you pick some up. I also threw in 3 fabric covered Moleskines using some of my Amy Butler Midwest Modern scraps. They are always very well received and super easy to make ... every time I make them, I wonder why I don't do it more often. A great scrap reducer, by the way. Anyway, it was one of the more popular gifts of the day -- stolen twice in the first 9 rounds of the Dirty Santa exchange, thereby frozen for the remainder of the swap! Oh, and before I forget, be sure to check out Scott's great giveaway over at Blue Nickel Studios. He just reached 200 posts, so I think some congratulations are in order! He's got 7 (!) amazing grab bags full of quilting supplies for some lucky readers. 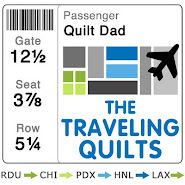 Head on over and enter ... be sure to tell him that Quilt Dad sent ya'! Now, here are a few things that I have been able to get done over the past few weeks. 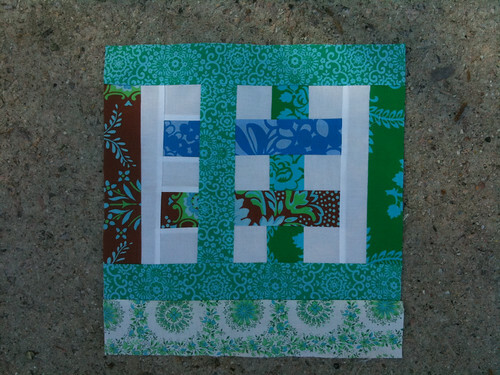 These two quilting bee blocks are both for Tacha (hanies), an amazing and prolific quilter from Berlin, Germany. October was Tacha's month in the bee inspired group ... and yes, this is the long overdue October block that I referenced a few weeks back! 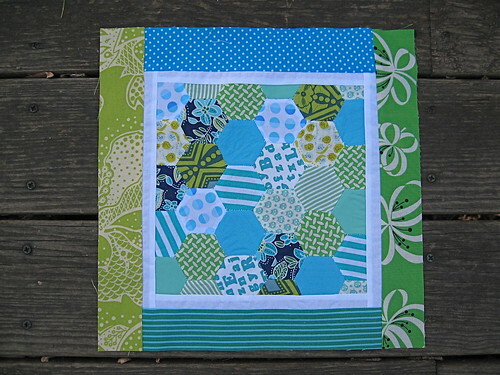 Tacha asked if we were up for the challenge of hand sewing some hexagons as the basis for her block. I was terrified and completely overwhelmed but, feeling accomplished by my recent mastery (ha!) 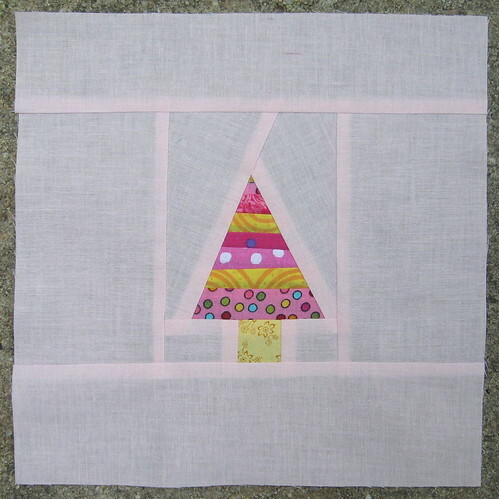 of paper piecing, I decided I wasn't about to back down from this challenge. Well, it turned out that it definitely was a challenge. 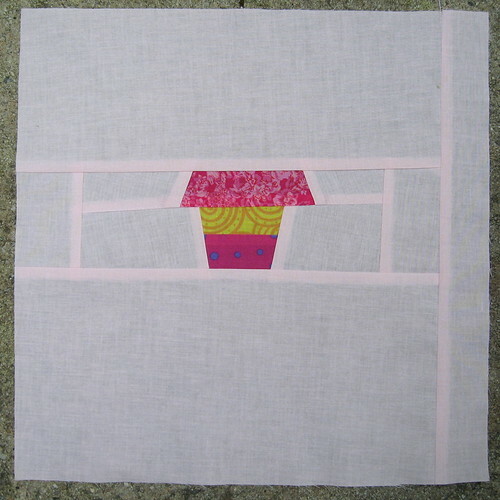 It took me nearly a week to make this single block, and my hand sewing skills are most definitely amateurish. I can't relate to all of you that talk about how meditative and peaceful you find making these blocks, since I alternated between feeling anxious, frustrated, nervous, and angry throughout the process. 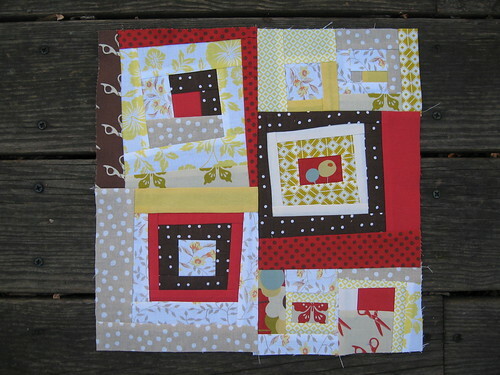 BUT, I am so happy that I tackled it, persevered, and finished the block. Sure, some of my seams are showing through, but I'm still very proud of finishing it. Take a good look, because I'm not sure I'll be making another one of these! November's block for Tacha for the Cottage Quilting Bee fell much more in the center of my comfort zone. Tacha asked for a range of squares & rectangles, which could include mini log cabins and could be wonky or straight. I looked back to a block I made for another quilting bee a few months back for inspiration, but was decidedly more wonky in my construction. I really love how this one came out, and the process of making it was a welcome change from the hand piecing of the previous block. I had a lot of fun using all of Tacha's different fabrics and choosing some coordinates from my stash. I hope you like it, Tacha! I'm going to try to get back over here at least once more before Thursday to wish you all a proper Merry Christmas. In the meantime, I hope you all are enjoying your friends, families, and the spirit of the season! P.S. 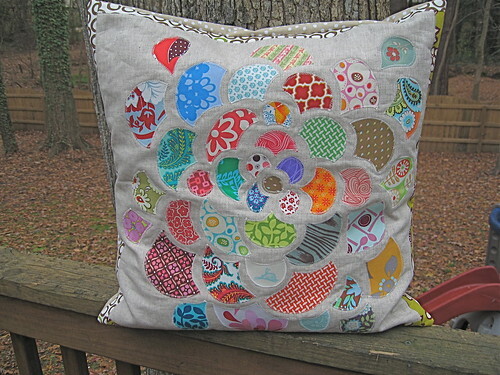 Thanks so much for all of your Quiltmaker love from my last post. I really appreciate it! 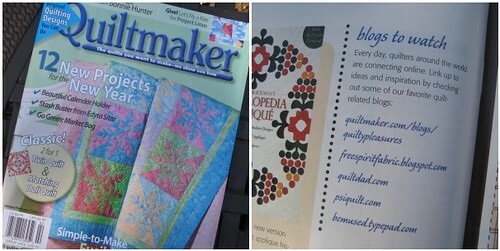 That's right -- that's this little ol' blog of mine featured in Quiltmaker magazine right above Rachel's blog (oh, hey girl!) I'm so happy and so humbled at the same time. Of course, as soon as I was tipped off about this, I ran right out to Borders to get my own copy -- and one for my mom, too! You know, when you make the decision to start something like a blog, it's with the understanding that -- to a certain degree -- you'll be exposing yourself completely to the world. It's a bit scary to embrace that kind of vulnerability. When I decided to start this blog and share not only the things that I make with my hands and from my heart, but some of the more personal details about my life and family, I never imagined how rewarding it would be to have anyone -- much less total strangers -- notice and even appreciate my creations and my passions. So all of that is just a very long way of saying "thank you" both to the team at Quiltmaker magazine and to all of you for reading my humble blog. You bring new joy to my life every day. I hope each & every one of you is having a happy, healthy, and peaceful holiday season. 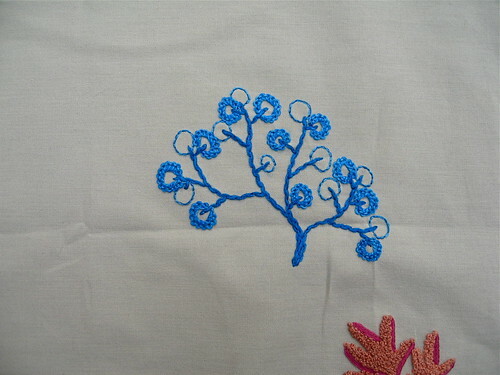 I started the tour by embroidering an initial design for myself to set the tone for the towel. I decided on this octopus design from the Badbird blog. 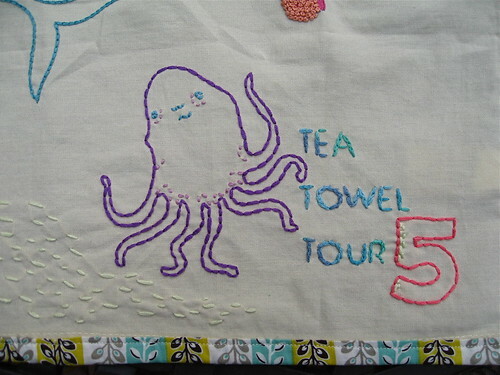 I had such a great time participating in my first Tea Towel Tour. 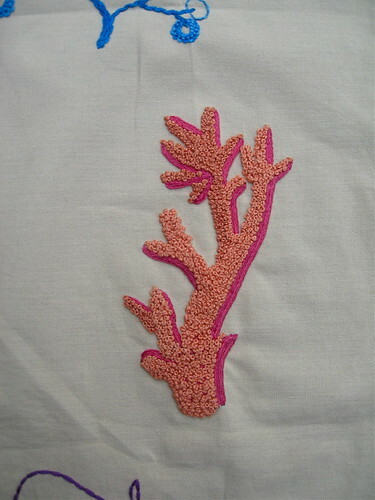 It has really helped me develop my embroidery skills and add a new dimension to my sewing and crafting. I hope to be able to rejoin the tour for round 6! Hello, everyone! I hope you all had a nice Thanksgiving. Ours was good, aside from the nasty stomach bug / flu strain that has been making its way from kid to kid to parent to parent over the past week. I think we have finally exorcised it from the Quilt Dad house with one daughter spared. Let's hope it stays out. I recognize that postings to the ol' blog have been sparse lately. Quite franky, my sewing time has been sparse, too. I've had a few new commitments pop up lately that have eaten into my evenings and I'm trying to figure out how to balance it all. My to-do list is nagging at me, and I find myself thinking three projects ahead of what's on my cutting table. Does this ever happen to you? 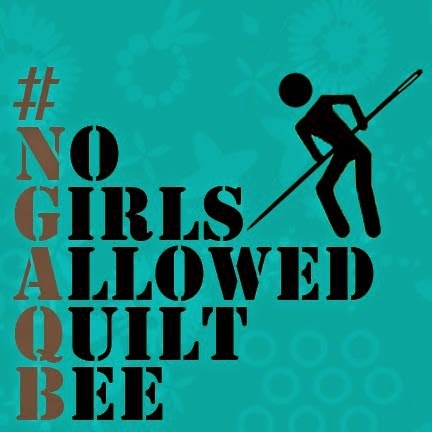 I've been trying (mostly unsuccessfully) to at least keep up with my quilting bee commitments. I've always prided myself on returning people's blocks back on time, but it's all finally caught up with me. 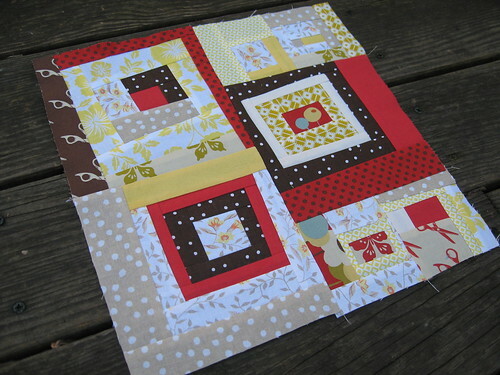 I still (embarrassingly) have one October block that isn't done yet (sorry, Tasha! ), and a couple of November blocks to complete. Fortunately, December's an off month for many of the bees and I desperately need the time to catch up. 'Cause, you know, there's nothing else happening in December to occupy our time. ... and a tree for Dee. October was Sonja's month in SewConnected 2. In true Sonja style, she assembled a truly eclectic and inspired grouping of fabrics and requested blocks with a "beach house" theme. It was very important to me to make something special for Sonja, because she always puts 150% into anything she makes for others. 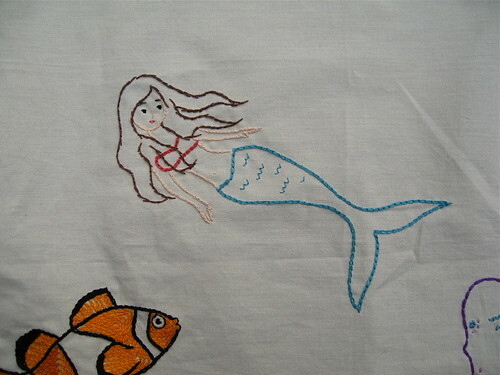 First, I decided to put my new embroidery skills to use and stitch up some whales inspired by the work of one of my favorite artists, Kurt Halsey. I bordered the embroidered piece with some prints from Tula Pink's Neptune line. 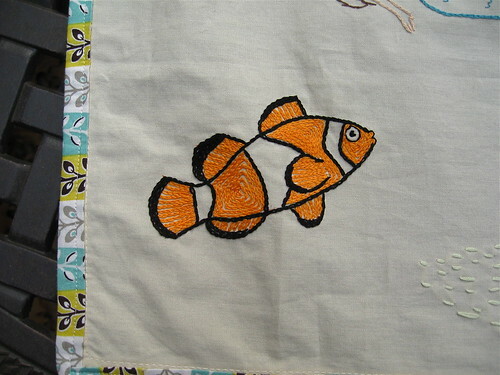 Here's a close-up of the embroidery -- I love how it came out! I had an idea for a second block for Sonja. 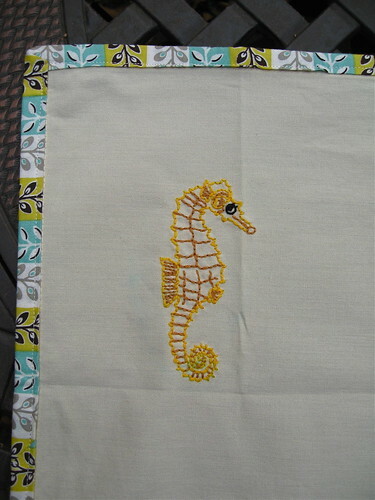 I decided to make a quilt block reminiscent of those old wooden beach signs (like this one). 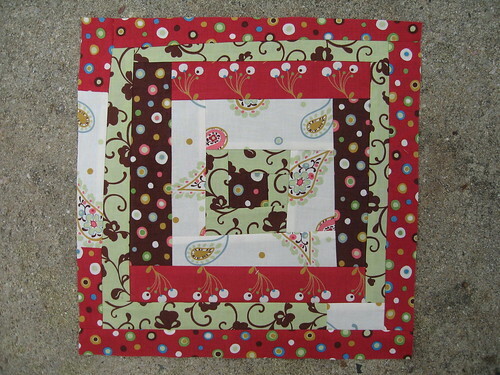 I used Lazy Gal Tonya's free-pieced letter tutorials to highlight all of Sonja's fabrics, and bordered it with a woodgrain that reminded me of driftwood (from the Lush line). Over in the Cottage Quilting Bee, Ariana designed her own block and asked everyone to help her make her first queen-sized bed quilt. Each swapper received a selection of fabrics in a specific color story and a solid gray. I received this WONDERFUL set of green prints, and I love the way they play off of the gray. 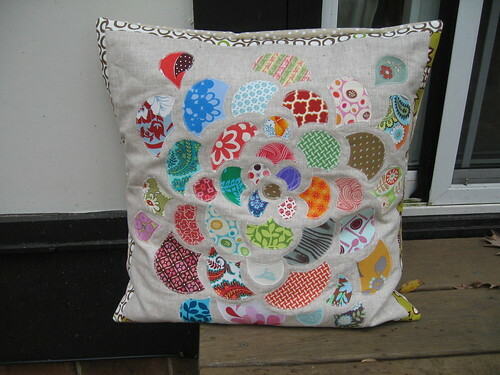 I deliberately embedded five little pinwheels into my fabric placement -- can you spot them? 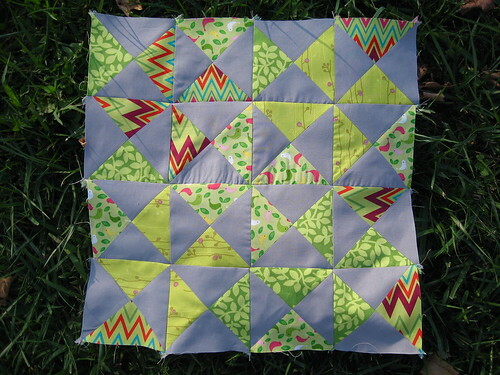 And finally ... hold onto your hats, people ... 'cuz Quilt Dad is paper piecing. Yes, that's right ... after so many months of resisting the urge, I finally took the plunge and taught myself how to paper piece. I am so happy to have finally gotten over my fear and apprehension, and I feel like a whole new world of possibilities have been opened up for me. I was motivated to tackle paper piecing because I really wanted to make the Color Wheel block for Julie for her Buzz Cuts block. Julie sent fabrics from the Neptune line and they seemed to me to be great candidates for the swirling geese in this pattern. 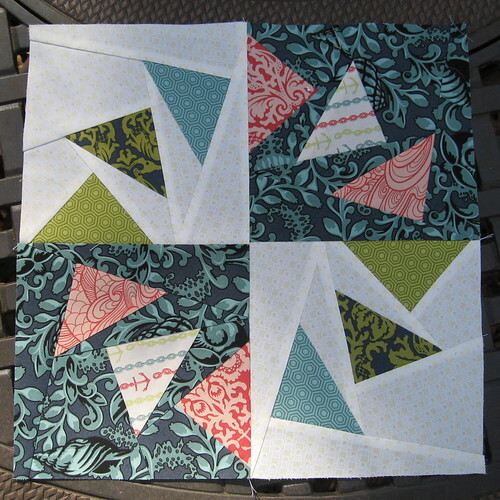 It reminded me of a whirlpool, which fit nicely with the nautical theme of Julie's blocks. I am THRILLED with how it came out! And that closes the book on October ... with the exception of that one final block for Natasha. It's next on my to-do list! 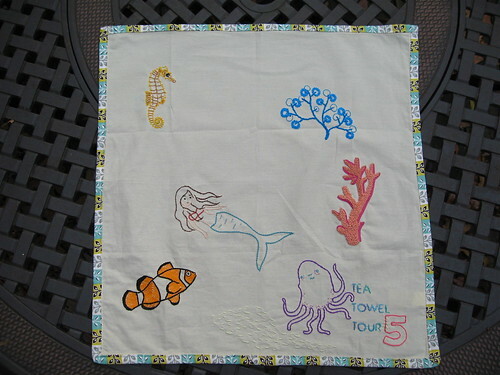 I have a few more things to blog about soon, including the Pillow Talk swap (for which I both made and received a homemade pillow lately) and the conclusion of the Craftster Tea Towel Tour swap, since I also received my completed towel back.